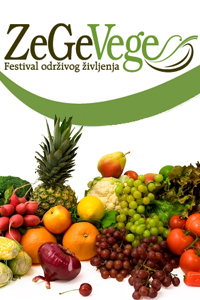 We are very pleased to invite you to the 5th ZeGeVege Festival of Sustainable Living! This year too the ZeGeVege will be held on the main square of Zagreb for two days - on Friday, September 7, 2012 (9 A.M. - 9 P.M.) and Saturday, September 8, 2012 (9 A.M. - 5 P.M.). This year's festival is organized within the Veganmania events, the famous festival that has been held for years in Austria, Germany, Switzerland, and this year also Slovenia and Croatia join in. On the main Zagreb square (Trg bana Josipa Jelacica) numerous exhibitors and performers will present themselves and attract many visitors with their offer, tasting and skills. On this ZeGeVege festival also, besides the tasty healthy food and over 50 stands, all visitors can expect free makeup and massages, promotional sales, environmental innovation, video projections, a daily program on the stage, and many other interesting things which will make it even more attractive. The Green Monday campaign (Zeleni ponedjeljak) remains a part of this unique and distinctive festival where everyone can find something interesting, fun, new and educational. We invite all who are interested as presenters, performers, sponsors, promoters and volunteers to contact us as soon as possible, so that together we can make the ZeGeVege Festival 2012 a memorable experience. Check out why the ZeGeVege Festival was visited so far by over 60,000 people! "K NARAVI" Alja Veronika Divjak s.p.